I'm not seeing anything unusual; isn't that just another tractor in the background? I just noticed the position of the cupholders. They look inconvenient and undersized. I do like the power outlets next to the cupholder and the little pocket that my phone would fit in. I see. The new cab does take some getting used to, but I don't think it's as bad as it could be (like the new combines). And don't worry about the English; yours is better than many Americans'. 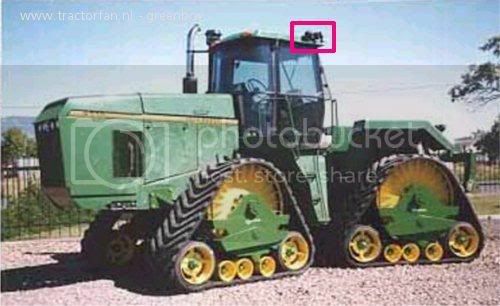 Cup holders always seem to be in awkward places on tractors when they are so convenient on combines. We have a 6715 that doesn't even have a cup holder. Had a service man down a while back working on the 8430. Asked him about the differences. He said they are working on building a scaffolding to work on the a/c on the R series since they decided to put it back in the roof after having it in the floor for a while.